An enumerator at work in southern Tehran in November. 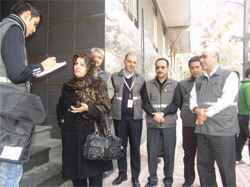 Staff from UNFPA and the Statistical Center of Iran also helped with the census. TEHRAN, Islamic Republic of Iran — This country’s 2011 Population and Housing census, which is run by the Statistical Center of Iran, a longstanding UNFPA partner, officially closed on Sunday, 13 November. This year, the country’s population is estimated to have surpassed 75 million in July. The census cost about $70 million and received technical and financial support from UNFPA. During a three-week period, 54,000 enumerators and 14,000 supervisors fanned across Iran’s 31 provinces to interview an adult from each household. Up to 114,000 individuals nationwide helped manage the census by visiting more than 21 million households in 100,000 rural areas and 1,200 urban centers. More than half of all enumerators were female to ensure that the census was gender sensitive -- a dimension introduced in Iran’s practices with UNFPA’s assistance during the previous census in 2006. Videos, multimedia CDs and advertisements were produced with UNFPA financial support to raise awareness about the census among the general public and in primary schools. 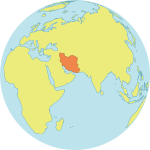 Delegations from Economic Cooperation Organization member states, such as Afghanistan, Pakistan, Tajikistan and Turkmenistan, visited Iran to learn from its best practices in enumeration. In 2006, the country committed to running a census on a five-year basis, going beyond international recommendations for 10-year cycles to reflect its highly dynamic demographic profile. For the first time in Iran’s history, the enumeration was done on an individual basis using national identification cards, rather than being household-based. Now, each questionnaire is unique – once data processing is completed, the questionnaires will provide much more specific information for government offices to use in national development plans and policies. Up to 3,300 training workshops were set up for enumerators. Some modules were done using a web-based system developed with technical and financial assistance from UNFPA. Not only are Internet training courses less time-consuming, they are also less costly and provide better coverage of census staff. Other time-saving census improvements included the use of personal digital assistants (PDAs) for data collection in several districts of Tehran, part of a pilot study also financed by UNFPA. Data collected with PDAs are instantaneously sent to the Statistical Center of Iran’s local processing center for immediate handling. This experience has been so successful that the center decided to use PDAs only for its data collection in the next census in 2016. An Iranian enumerator doing interviews in southern Tehran while other statisticians assist. To speed up data processing in provinces that used paper questionnaires, UNFPA provided financial support to the statistical center to upgrade its Intelligent Character Recognition software, which allows for quicker identification of Persian handwritten script. A Reproductive Age Mortality Survey is also a new practice, which will help use the census data to track maternal mortality in Iran. Reports of female deaths given by respondents are transferred to the Safe Motherhood office in the Ministry of Health, which will follow up with households to investigate whether the cause of death was related to maternal health. This method helps improve coordination among government offices. Exceptionally heavy snowfall in northern parts of Iran in early November caused severe disruptions to circulation, heavy traffic, road closures and power outages, leaving many locations inaccessible for one to two days in some areas. While the weather created serious challenges in reaching households at this time, SCI completed the census on time, thanks to its highly dedicated and well-trained staff. Despite major outreach by government authorities to educate the public about the census, some respondents could have benefitted from more information to better understand the process and the implication of their participation. Preliminary census results will be ready in early 2012, with Iran’s final report due by June 2012.